Fentanyl is an old drug, invented more than half a century ago and relatively easy to make for a competent chemist. So why is it that it’s only recently become popular? I asked that a couple of days ago, and today drug guru Mark Kleiman answers. Long story short, Fentanyl is (a) very powerful and (b) requires only minuscule doses. This means that the difference between getting high and getting killed is only a matter of a few micrograms. In turn, this means that when you cut it for street distribution, you better cut it pretty damn accurately. If you don’t, you’re going to leave a big trail of dead people in your wake, and that’s bad for business even if you don’t get caught and tossed in jail. Then we got hit with a wave of prescription-opioid (mostly hydrocodone and oxycodone) diversion and dependency that started around 1992….As those oxycodone users built up habits they could no longer afford, or lost access to a script-happy M.D. or a “pill mill” pharmacy, the falling price of heroin enticed many of them to “trade down.”…At the same time, people in the U.S. were learning how to buy chemicals unavailable here – banned drugs, cheap unbranded pharmaceuticals, Human Growth Hormone, you name it – by mail-order from illicit or quasi-licit outfits in China. ….It didn’t take long for some of those Chinese outfits to start making fentanyl; unlike heroin dealers, they didn’t need a source of opium. The chemistry involved isn’t especially challenging (not, for example, like making LSD). Fifty grams of fentanyl – an ounce and a half – has the potency of a kilogram of heroin, and it’s way, way cheaper. Somewhere in here someone figured out a technique for diluting the stuff with enough accuracy to reduce the consumer’s risk of a fatal overdose: far from perfectly, but enough to create a thriving market. And for a retail heroin dealer, the financial savings from buying fentanyl (or an analogue) rather than heroin, and the convenience of having the material delivered directly by parcel post rather than having to worry about maintaining an illegal “connection,” constituted an enormous temptation. For law enforcement, the parcel-post approach makes a hard problem nearly impossible….On top of that, the “technology” of illicit retail drug distribution has been transformed by the introduction of mobile phones. Thirty years ago, illicit retail drug transactions were characteristically carried out…in low-income, high-crime urban neighborhoods….Having to travel to such a location – risking arrest or robbery – constituted a significant barrier to illicit acquisition….But with mobile phones, texting, and social media, transactions can now be arranged electronically and completed by home delivery, reducing the buyer’s risk and travel time to near zero and even his waiting time to minimal levels. In the recent Global Survey on Drugs, cocaine users around the world reported, that their most recent cocaine order was delivered in less time, on average, than their most recent pizza order. So there you have it. Legal opioids seemed safe because they came from doctors or friends, and opioid addictions eventually led some people to heroin. Then Chinese outfits figured out how to make relatively safe fentanyl, and it was so compact they could just ship it to the US via ordinary parcel post that’s all but impossible to detect. Add in cell phones so customers don’t have to wander around sketchy neighborhoods at dark, and the cycle is complete. Oh, and fentanyl is far from the most potent synthetic opioid out there. Getting high on fentanyl typically requires about 100 micrograms. Carfentanil requires about 1 microgram. You could ship that from China in an ordinary first-class letter. 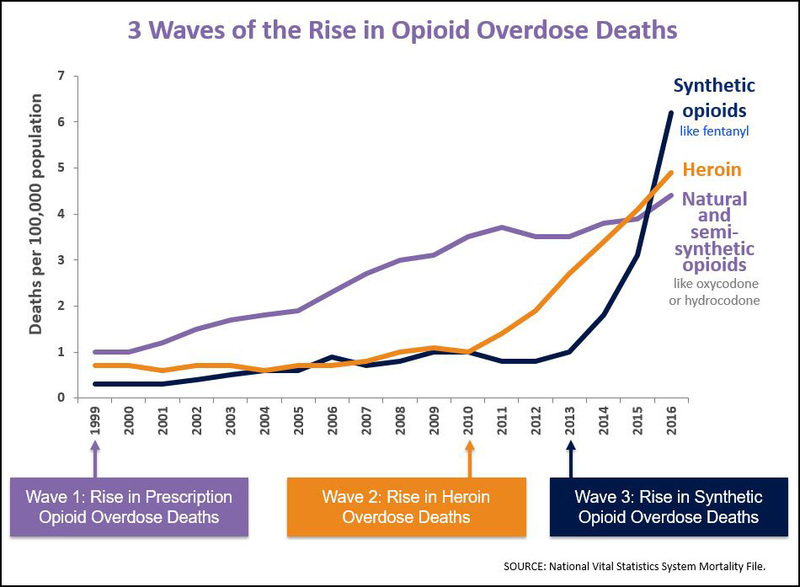 It’s a brave new opioid world out there.